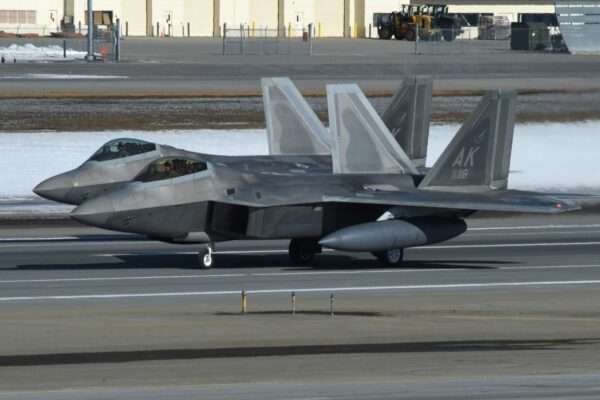 F-22 Raptors from the 3rd Wing and 477th Fighter Group participated in a close formation taxi, known as an “Elephant Walk,” last week at Joint Base Elmendorf-Richardson, Alaska. The 24 F-22 fighter jets were joined by C-17 Globemaster III transport and an E-3 Sentry, comprising the largest of its kind and including roughly 20 percent of the Air Force’s entire combat coded F-22 fleet, The Drive stated. The maneuver is called “elephant walk” because of the close formation of the military aircraft while taxiing before takeoff. The term originated in World War II when allied bomber operations consisted of 1,000 aircraft and their attacks were carried out in a single file, nose-to-fail fashion that resembled elephants traveling to the watering hole. The video displays each aircraft lined up on the tarmac, taking off into flight and then returning to the airstrip. 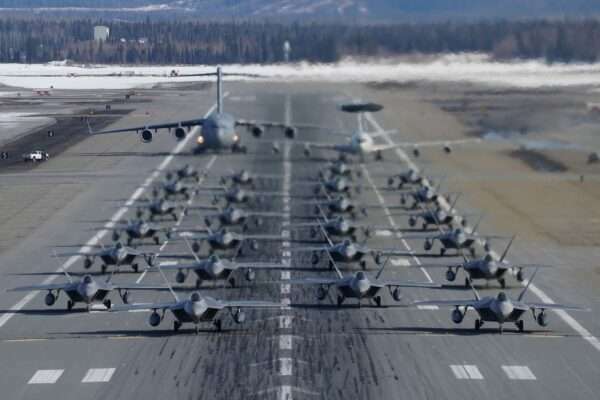 Aside from training purposes, the elephant walk is a way for the military to show off their ability to swiftly position many aircraft at the same time and serves as a visual warning to adversaries. Joint Base Elmendorf-Richardson is responsible for monitoring and intercepting foreign aircraft that may near or cross into U.S. air space. Past elephant walks conducted by the Air Force have included 30 A-10 Warthogs, a group of Japan-based F-15s, a bunch of A-10s and F-16s, and the F-35 Joint Strike Fighter, according to Yahoo News. The display took place during the Polar Force exercise that will run through April 5. Polar Force is a two-week exercise held semi-annually that gives troops a chance to demonstrate their skills to forward deploy and deliver awe-inspiring combat air power. The exercise tests how well the base can prepare a response to crises in the Indo-Pacific region, since it would be the first to respond to such incidents in the region. Lt. Col. John Krellner said, 3rd Operations Group deputy commander, said, “It gives us the opportunity to demonstrate our ability to execute our wartime taskings. We accomplish quite a bit with the Polar Force exercise. Number one is we stress the system,” the Alaska Star reported.